A black and white photograph of the Dunlop Tire and Rubber Company. 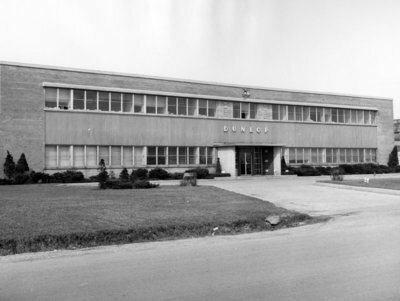 The Dunlop Tire and Rubber Company was built in 1954/55. It was sold to Firestone Tire in 1974 and renamed Dayton Tire and later Whitby Tire. The factory closed in 1980, and was divided into small industrial units. Located at 202 South Blair Street. Dunlop Tire and Rubber Company, c.1964, Bill Stannett. Whitby Archives A2013_026_001.